2016 ends a rather horrible year for celebrities and world news with the strike of midnight tonight. We've lost some amazing musicians, actors, philanthropists, scientists, and generally good people in 2016 as well as seeing crises escalate in Syria, Russia, Europe, and the US. The economy was up and down which is fairly normal, but inflation once again outpaced salary increases as people pinch their pennies tighter. It was a rather tough year on the whole, but hockey will send us into the new year of 2017 with an amazing story that involves the man in the Hurricanes t-shirt above. In case you missed it because it was on super-early this morning, Canada started the day off with a gold medal! In the Spengler Cup Final, Canada met up with HC Lugano of the Swiss League in a rematch of last season's Spengler Cup Final. Lugano started things off quickly as Dario Bürgler ripped a slapshot high on the short side on Zach Fucale just 31 seconds into the contest to out the Swiss side up 1-0. Manitoba's Chay Genoway would respond at 5:02 to tie the game, and Canada's speed and skill began to take over this contest. Second-period goals from Marc-Antoine Pouliot and Cory Emmerton while shorthanded before the three-minute mark of the second period put Canada firmly in control of this game. Andrew Ebbett added a fourth Canada goal late in the period while Canada's penalty kill held the Lugano side at bay while up a man. Canada went into the second intermission looking like a team that had played together for the entire season as opposed to four games while Lugano needed some offence in the third period if they were to erase a 4-1 deficit. Bürgler would finally break the Canadian penalty-kill with his second of the game at 4:08, but a Nick Spaling goal with 17 seconds to play would ice the game after a fourth outstanding performance from Zach Fucale in the Canadian nets to give the Canadians the 5-2 victory and their second-straight Spengler Cup! The opposite results dominated the Canadian performance in Toronto as the Americans and Canadians met at the World Junior Championship. I have to hand it to the Americans who used their power-play effectively to go up 2-0 in the first period before dominating the Canadians below the hash marks at both ends of the rinks to earn a 3-1 victory over the highly-touted maple syrup squad and, more importantly, top spot in Pool B for the quarterfinals which will see the Americans play Switzerland while Canada will now tangle with the Czech Republic. I was thoroughly impressed with the goaltending-by-committee that the Americans did in blocking shots and taking away passing lanes in a tight formation in front of Joseph Woll. They played tenaciously in their own zone, rarely giving Canada space to make plays, and were quick to break out of their zone with good passing once they caused a turnover. That excellent defensive zone pressure and play were, for me, the difference in the game between the two teams. On the offensive end, Jordan Greenway, a tank-on-skates Minnesota Wild prospect, bullied the Canadians below the hash marks as he often found his way to the front of the net with the puck despite two red jerseys standing in front of him. The Americans found seams in the Canadian defence, they took the puck to the net, and they didn't settle for shots from the outside. Kudos to the Americans for doing the little things that make teams successful. Team USA earned this victory, and it was well-deserved with a solid execution of a game plan. After that game, the Jets and Islanders met for a New Year's Eve tussle at MTS Centre, and this one was a tire fire if you're a Jets fan. The Islanders came into the game having lost to Minnesota in which they pushed one of 2016's hottest teams to overtime with a third-period rally, so the Jets would have to be ready to play another error-less game if they wanted to get by a team whose record doesn't show its full potential. Instead, the Jets gave up six goals on 24 shots between two goalies, falling 6-2 to the Islanders. How a team can utterly dominate a good team like the Blackhawks before falling into lapses of confusion and bewilderment against the Blue Jackets only to see everything fall apart against the Islanders is why following the Jets as a fan is hazardous to one's health. This team is wildly inconsistent, and I am going on record here on the last day of 2016 to say that the Winnipeg Jets will not participate in the postseason again this year. Bold move, Cotton, but they simply don't have the consistency to run with the teams in the Pacific that play consistent hockey to earn a wild-card berth. 'Nuff said, and moving on. That's where the image at the top of the page comes into play. The Carolina Hurricanes aren't having a very successful season either, but they are producing some feel-good stories for fans to follow. 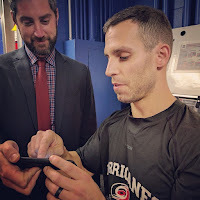 The man in the Hurricanes t-shirt is equipment manager Jorge Alves, and he is signing a contract to backup Cam Ward for the night after Eddie Lack came down with sickness prior to their game against the Tampa Bay Lightning. 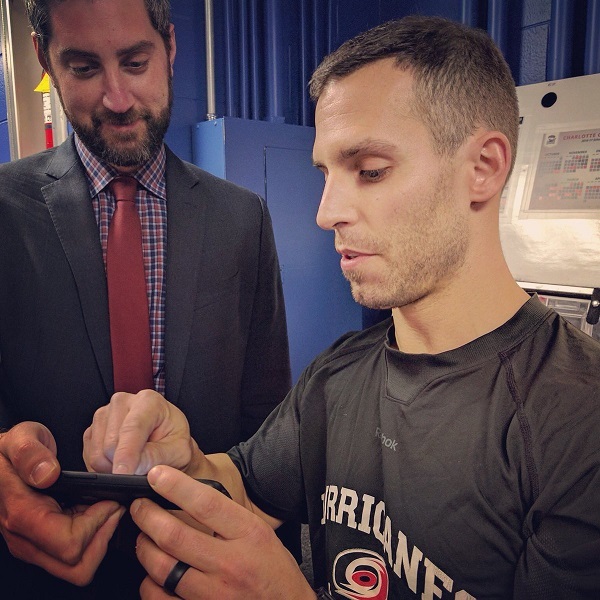 Alves is 37, and he's been the equipment manager of the Hurricanes since the 2012-13 season. Why is this significant? According to reports, Alves practices with the team on a consistent basis, so he's faced NHL shots in practice. While the Hurricanes take it a little easier on the non-NHL goalie than they do when facing Lack and Ward in practice, the fact that Alves participated in practices should have made his job a little easier tonight. While he's played a little in the ECHL and SPHL, Alves has never led a team onto the ice in the NHL until tonight. The Hurricanes did the classy thing and sent Alves out first for the pre-game skate! Pretty cool, right? Oh, but it doesn't end there for Alves. For 7.6 seconds, Jorge Alves got to live a dream by standing in an NHL net! You skeptics can try to downplay Alves' appearance any way you like, but he's now appeared in 7.6 seconds more NHL games than you or I. That, readers, is entirely awesome for a guy who might have shelved his netminding dreams in order to make sure others achieve their dreams. For the Hurricanes and head coach Bill Peters to give Alves his 7.6 seconds of glory as well as skating off the ice at the end of a game, that's one of the best stories to come out of hockey in 2016. With that, we're off to 2017 and there will be a number of new stories written, both good and bad, on which HBIC will most likely comment. I'd prefer to see a pile of good stories in relation to bad stories, and we'll certainly get a number of these in February when the NHL unveils its "Hockey is for everyone" campaign. Let's all come together, fans of every walk and every team, and do some amazing things in 2017 for each other, for others, and for everyone. Normally, the look seen to the left on Jukka Rautakorpi's face are saved for characters in horror movies realizing that the end is near for him or her. 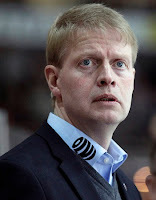 With Finland's World Junior Championship team in the midst of their own horror movie when it comes to this year's tournament results, head coach Jukka Rautakorpi's facial expression might be appropriate because the end was near as Finland reportedly fired their coaching staff ahead of their final tournament game. Honestly, this has to be one of the most disappointing results in the tournament's history. You have to wonder if this move was done knowing that next year's coach, Jussi Ahokas, was in Montreal scouting players for next year's tournament and taking notes on the other teams. Regardless of why it was done, Finland ousted Rautakorpi and his staff as Finland stares down a relegation series after winning the gold medal one year ago. It's the first time in World Junior Championship history that a gold medal-winning team fro the previous year has played in the relegation series. That's not the kind of history that any country wants to make, let alone a proud hockey nation like Finland. Finland found themselves in the likes of Canada and the US where their best young players were already playing and contributing in the NHL, making those players such as Patrik Laine and Jesse Puljujarvi unavailable for this year's event. As a result, Finland came over with a fairly young team looking to carry forward the success of last season's victory that rested almost entirely on the Laine-Puljujarvi-Aho line. Those three outscored a lot of teams, but it was thought the Finns would bring a more complete team game to counter the missing offence that was playing in the NHL. Instead, the Finns struggled to score at all points, having scored just four goals in three games thus far. Yikes. With the Swiss beating Denmark in the shootout in their game, the Finns and Latvians will meet in the relegation series with the loser in the best-of-three series being demoted to the IIHF Division-1 World Junior Championship next season. If Finland were somehow to lose two of three games to Latvia, this would be one of those moments where hockey would come to a screeching halt in Finland and a national examination would be done of the program. I suspect that Finland will beat Latvia, however, despite both teams being among the lowest-scoring teams. Latvia has given up significantly more goals thanks to their beatings at the hands of Russia, Canada, and the USA. Finland has yet to record a point ahead of what is now a meaningless game against Switzerland tomorrow. Ahokas, who will take over on the bench tomorrow, was here working as a video coach after serving as the head coach of the Finland U-17 team. While there is almost zero pressure on him in the Switzerland game, it would serve Ahokas well to pick up three points with a win in regulation time. Finland's national program will undoubtedly be keeping a watchful eye on this game with thoughts on next season's tournament in Buffalo already in the planning stages. Extraordinary circumstances resulted in extraordinary decisions being made. I can't think of the last national program to fire its coaching staff mid-tournament based solely on results in that tournament. With Finland etching their name in the historical records with their rather dismal results, changes had to be made at some point. I guess the Finnish National Team decided sooner was better than later. The Hockey Show, Canada's only campus-produced hockey radio show, is back tonight with a couple of phone calls! We have our main Oilers correspondent back in the City of Champions to give us an on-the-scene update about what to expect from the Edmonton Oilers when they host the Los Angeles Kings tonight. TJ will have a full report from somewhere near Rexall Place in the opening few minutes of the show as we get caught up with him. 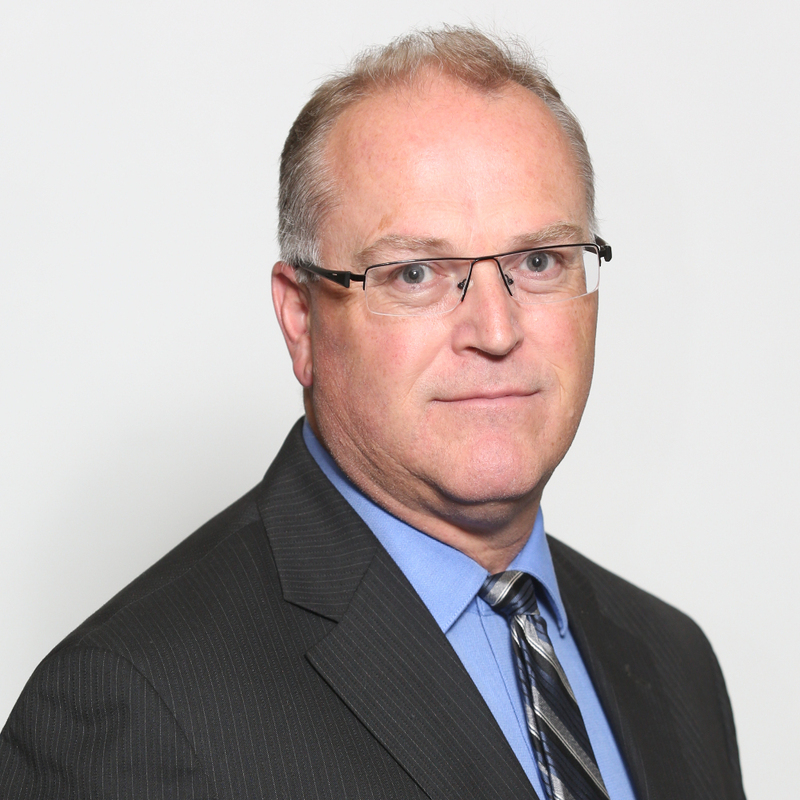 For the remainder of the show, we'll speak to a Manitoba legend when it comes to coaching as he's won all sorts of accolades and earned achievements at the MJHL level, the CIS level, the WHL level, and on the international stage! The man to the left is current Brandon Wheat Kings assistant coach Don McGillivray, and we are thrilled that he's joining us tonight! Don has basically seen it all in his coaching career having coached five different MJHL teams, becoming the head coach for the University of Manitoba Bisons men's hockey team, joining the Prince Albert Raiders as an assistant coach before taking over the head coaching position, and working with Hockey Canada and leading the Canadian entry at the U17 Hockey Challenge. There were accolades and championships, highs and lows, some characters both on and off the ice, and a few moments that I'm sure he hasn't forgotten over his career, and we'll talk to Mr. McGillivray about a number of these things tonight on the show! You don't want to miss this one as we climb inside one of the most distinguished coaches to ever come out of the Keystone Province! If you're a proud owner of an iDevice or Android device and want to listen to The Hockey Show, you can easily listen to the show by downloading the UMFM app! Just follow this link on your iDevice or this link for your Android device and get the UMFM app! It's never been easier to tune into The Hockey Show! Give the gift of great, free music and interesting interviews by downloading the UMFM app today! We welcome Don McGillivray to the show tonight where we talk coaching, winning, losing, the MJHL, the WHL, and more on The Hockey Show only on 101.5 UMFM and on the UMFM app! With normal life resuming today, it's back to work for your humble author. Knowing this fact, it was apparently a very destructive holiday period for people at my workplace as I had a number of computers to fix and maintain today. I was drowning in disassembled computers until mid-afternoon in order to "frankenstein" a few working pieces together to make complete machines. To say today was challenging when it came to solving technical problems would be pretty close to hitting the mark. With work back in full swing for me, I'm taking the day off. I have another double-header of outdoor hockey games tonight as the Stingers - who employ me on defence - look to move to 4-0 on the season. I expect us to continue our winning ways after defeating our arch-rivals and another solid team by scores of 3-1 and 6-4, respectively, in last week's games. Playing tonight's games will also eat into my free time, so let's take today off and reconvene tomorrow for another solid edition of The Hockey Show. I don't take many days off from the hockey world, but sometimes there just isn't enough time in the day for me to sit down, collect my thoughts, compose an article on those thoughts, and still live whatever so-called life I have. But, boy, do I love the rush of doing it! There are times in hockey when over-the-top celebrations fit the moment. When Belarus defeated Sweden at the 2002 Salt Lake City Olympics. When the Americans beat the Soviets at the 1980 Lake Placid Olympics. When Hungary beat Belarus for their first World Hockey Championship victory in 77 years at the 2016 IIHF World Championship. All of these victories were momentous occasions for those hockey programs when the odds were so heavily stacked against them that no one would give them a chance of surviving, let alone winning. We can add one more story to those moments as Denmark, for the first time in its program's history, took on the reigning World Junior Champions in Finland and came away with the most unlikeliest of victories. Granted, this is not the Finnish squad that outscored every other team on their way to a gold medal last season, but there was still enough talent on paper to make the Danes a rather simple foe. Denmark, to their credit, always seem to find some magic at these tournaments, and this victory over Finland almost assures them of a quarterfinal berth and a return engagement next year in Buffalo. While no one will anoint Denmark as a hockey superpower just yet, their record at the last two World Junior Championships is enough for them to be credited as one of the top-eight countries in the world right now. For a country with just over 2500 junior-aged players, we might be seeing a changing of the guard. In 2015 tournament in Canada, the Danes took the Russians to a shootout in their opening game with Russia finally downing the plucky Danes in the skills competition for a 3-2 win. Sweden out-everythinged the Danes in a 5-1 victory before Denmark took the Czech Republic to extra time in their game. An overtime goal by the Czechs prevented the Danes from their first win, but they had taken points off both Russia and the Czech Republic in their first three games - something they had never done before. In a game where the Danes never led and used two power-play goals to make the score 2-2 and 3-3, the Danes withstood a 45-shot barrage - credit to netminder Georg Sorensen - to force a shootout against a Swiss team many thought should have been better with the likes of Timo Meier, Mirco Muller, and Kevin Fiala on the roster. In was in the skills competition where the talent of the Danes' best shooters came to light as Nikolaj Ehlers and Oliver Bjorkstrand scored on the Danes' first two shots while the Swiss only saw Timo Meier score. It should be noted that Kevin Fiala was denied by Sorensen in the shootout. The 4-3 win was, to date, the biggest win in the Danish squad's history as it virtually guaranteed their inclusion in the 2016 World Junior Championship in Helsinki, Finland. Lo and behold, the Swedes dispatched the Swiss to send them to relegation, and Denmark, having already recorded their biggest win on the international stage, went to the quarterfinals where they were summarily dismantled by Canada to the tune of 8-0. Game, set, tournament. The 2016 tournament saw the Danes upset the Swiss again, albeit in their first game of the tournament this time. Switzerland jumped out to an early lead off a Noah Rod goal midway through the first period, but the Danes rallied in the third period with goals 5:03 apart as Soeren Nielsen got the scoring started and Mathias From added the second goal. 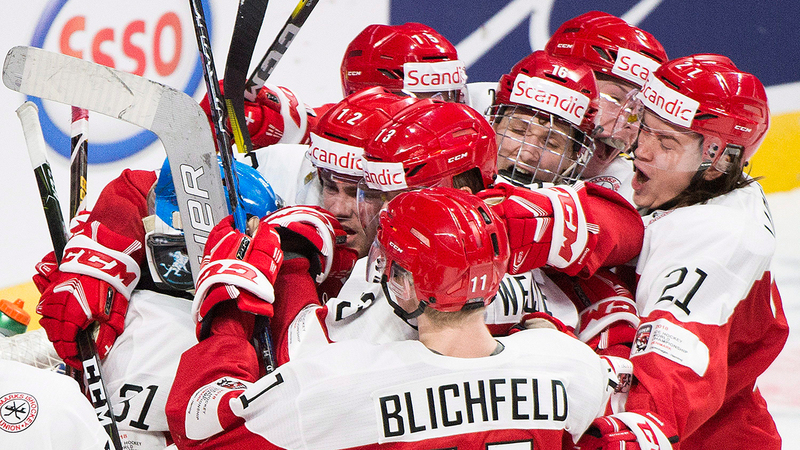 Thomas Lillie once again withstood a furious finish to end the game with 22 saves on 23 shots, but the win against the Swiss would be the only win recorded by the Danes at the 2016 World Junior Championship. The win was enough, however, to get them back to the quarterfinals which automatically qualified them for a trip to Toronto and Montreal for the 2017 World Junior Championship! The quarterfinal was almost the Danes biggest win ever. Leading 3-2 over Russia late in the third period, the Danes saw Vladislav Kamenev score with the goaltender on the bench with 44 seconds remaining to push the quarterfinal game to overtime. And it would be Kamenev who broke the hearts of the Danes in the extra frame. Gee, could those announcers be any more excited than they are for that overtime goal? You'd think they were emceeing a funeral with that kind of passion for the game. Wow. Before we look at this year's major win by the Danes, let's review: two losses to the Russians where the Danes took them to extra time and beyond, a loss to the Czech Republic in overtime, and their only two victories at this event came over the Swiss. One can make the argument that the Czech Republic has fallen from its powerhouse status that it once was to become an also-ran, and the Swiss seem to have stagnated with only a handful of players that have even impressed scouts in the last few years. Russia, however, is still considered a perennial powerhouse, and the Danes have scared them twice in two years. It might be time to start giving Denmark a lot more credit for their development program, especially with players such as Fredrik Andersen, Nikolaj Ehlers, and Oliver Bjorkstrand leading the way as trailblazers for that country's improvement on the international stage. Starting Finnish netminder Veini Vehvilainen allowed two goals on three first-period shots, and was replaced by backup Karolus Kaarlehto to start the second period. The Finns, however, never really put much pressure on Denmark's defence or netminder, and shots fired at Kasper Krog were easily turned aside. While the third period was better for the Finns, they dug themselves a 3-0 hole from which they simply could not recover. "We always should beat Denmark, or at least score more goals than two goals with those shots," Finnish captain Olli Juolevi told reporters. "I don’t know. There are no excuses." Highlights of the game are below. For the Finns, they are in serious danger of being placed in the relegation round after this loss. For the Danes, this is as big an upset in World Junior Championship history as the Swiss knocking off the Swedes 2-1 in the quarterfinal and the Czechs 4-3 in the bronze-medal game in 1998, Belarus shocking the Americans by a 5-3 score in 2005, or Switzerland upsetting the Russian in the quarterfinal in 2010. However, as shown above, the Danes are an upward trend when it comes to their junior program, and they've slowly been edging their way towards being one of the better countries for the last three years. No one is going to put them in the top-four just yet, but they have closed the gap on teams like Finland and Russia when it comes to their play. Congratulations, Denmark, on a huge victory for your program. The work and efforts going into your junior programs at home are paying off with each victory along the way, and today's win over last year's champions should be vindication that your programs are bearing fruit. Mother Nature, it seems, is not without a sense of humour. That photo, captured by the Winnipeg Free Press, is of Brian Petrusiak as he moves the immense amount of snow off his property's walkways and driveway that fell overnight. While it's traditionally Boxing Day in Canada which means many are out and about seeking the best sale of the day at stores, the majority of people in my city woke up to mountains of snow only to don boots and snowsuits as they grabbed their shovels to dig out from the foot of snow that fell overnight. 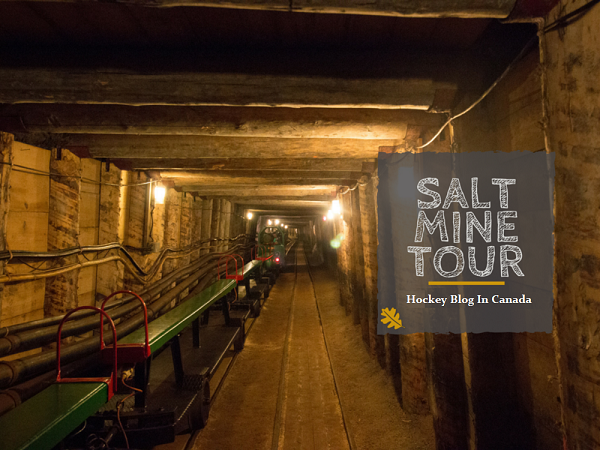 Why is this relevant to a hockey blog? Because all of the best mid-season international tournaments start today! The Spengler Cup kicks off in Davos, Switzerland while the World Junior Hockey Championship starts this afternoon in Montreal and Toronto, and it's a perfect day for a snow day to be stuck inside and watching some excellent international hockey! Both of the Canadian teams will play today as the Canadian men will face-off against the KHL's Dinamo Minsk this afternoon while the Canadian juniors will square off against Russia in Toronto tonight in their opening game. In both cases, the Canadian teams will need to be up to the task as their opponents are skilled enough to win their entire respective tournament. Dinamo Minsk enter the Spengler Cup in fifth-place in the Western Conference in the KHL, just two points behind Lokomotiv Yaroslavl and two points ahead of Dynamo Moscow. Canadian Craig Woodcroft coaches the Belorussian team, and they come into the tournament having won five straight games since December 6. They're the sixth-highest scoring team in the KHL with 117 goals-for, but are middle-of-the-pack when it comes to goals-against with 106 to date. They're the third-most penalized team in the KHL with 664 PIMs, but they still have a penalty-killing efficiency of 34 goals on 182 attempts-against for 81.3% and they've added four shorthanded goals. On the other side, Minsk is deadly with the power-play as they sit fourth in efficiency with 42 goals on 179 attempts for 23.5%, but have also given up four shorthanded goals. In short, Dinamo Minsk should be a solid test for the Canadian Spengler Cup entry in their opening game. Minsk has a netminder that most NHL fans will recognize in Ben Scrivens. The former Leaf, King, Canadien, and Oiler has moved to the Belorussian club and put together a 21-14-4 record on the strength of a 2.22 GAA, .919 save percentage, and seven shutouts. Those seven shutouts? They lead the KHL, and Scrivens recorded two of them in the final three games Minsk played before making their way to Davos. Another name that will stand out on the roster is Marc-Andre Gragnani. The former Sabres, Canucks, and Devils defenceman has a goal and 23 assists in 38 games this season and leads Minsk's defenders in scoring. Minsk also employs former Canucks defenceman Lukas Krajicek, but he's been injured for a portion of the season and has only played in 18 games where he recorded just four helpers. Up front, there's a familiar name for Blackhawks, Senators, Coyotes, Penguins, and Oilers fans as Rob Klinkhammer suits up for Minsk. The grinding forward may have found a home in Belarus as he's played in 37 games and recorded 16 goals and 13 assists thus far! That's just six goals behind his career NHL total! The other name that will resonate with NHL fans is former Canadiens sniper Sergei Kostitsyn. Kostitsyn's production has dropped off in the KHL, but he's still producing in 30 games with four goals and 17 assists over that time. He'll turn thirty next March so it's tough to say he's past his prime, but Kostitsyn has been averaging around 30 points per season since 2012-13. They need him if they want to make a run deep into the Gagarin Cup Playoffs. As we switch our focus from Minsk to the Russian team in Toronto tonight, it should be noted that the vats majority of the Russian squad is 19 years of age, so they'll come in as one of the oldest teams at the World Junior Championship this year. That experience may help the team, but they're still going to have to play well to get past the Canadians and Americans in their pool. One player the Canadians will need to get to will be goaltender Ilya Samsonov. Samsonov plays with the KHL's Metallurg Magnitogorsk, and he's putting up some insane numbers as he's 12-1-3 with a 2.06 GAA, a .936 save percentage, and one shutout. Samsonov stands at 6'3" as well as being athletically-gifted, so beating the Russian goaltender will be a challenge due to his ability and size. Canada will have to get him moving to open him up, so lots of shots and screens will go a long way in getting Samsonov off his game. Before any hockey can be watched by me, however, I need to suit up and dig out from Mother Nature's gift of a foot of snow. There is a lot of snow surrounding HBIC Headquarters, so this might be more than an hour or two. If you don't hear from me in a few days, just assume that the snow got the better of me and I'm now living happily in a snow fort in my backyard. It's Christmas Day, folks. My day will start a little later than usual thanks to my mom doing something awesome for another person. My mom has volunteered to work the morning shift at her job in order to allow a woman who has three young children to be with her family this morning. That's entirely what this holiday is about - thinking of others before yourself. I'm blessed to have a great family and great friends. 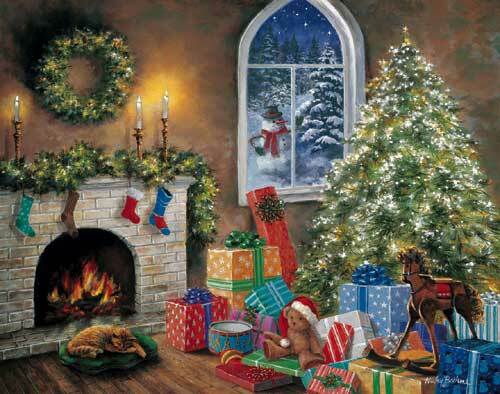 Christmas is weird because we submit lists of stuff that we want, but we were always taught to want what you have. I'll appreciate the gifts given to me tonight, but I'd rather see my family happy and excited about their gifts. I appreciate my family more than they could imagine, and I want to see them happy and healthy for many years to come. Enjoy the time you have with family and friends today, folks. They are a key to our mental and physical happiness, and this is the season to make sure they know how important they are to you. Thank them for their gifts, share in some great food, and enjoy the laughter. Christmas is a great day for celebration, and you can't celebrate alone. Family and friends make all the difference! Until next time, Merry Christmas to you and yours from HBIC! The day before the day is finally upon us, and there are mere hours of shopping left for those that like to leave it to the last minute. I'll be spending part of the day with family before returning home to settle in for a long winter's nap. If there's one thing that makes Christmas Eve feel a little more special, it's the annual reading of "A Visit From St. Nicholas", better known as "'Twas the Night Before Christmas". While I'm old enough to know that I no longer have to settle around a chair while someone with many Christmas experiences reads the poem, it still needs to be done to cap off the season. It won't be me reading it today nor will any other member of my family as far as I know. Instead, I will leave you with the members of one of the most experienced hockey teams on the planet as the Montreal Canadiens read "'Twas the Night Before Christmas". Enjoy! Until next time, Merry Christmas everyone! It might be one of the all-time greatest episodes of Seinfeld. I am, of course, talking about the Festivus episode where George informs the group of his father's made-up holiday. There's the aluminum pole, the feats of strength, and the airing of grievances which happen on Festivus, and HBIC is going to participate in one of these events today. Hockey has many great qualities, but there are simply things that need to change. In saying this, HBIC is happy to air a few grievances today over the state of the game in its many forms. Some you'll agree with while others will raise eyebrows, but I'm pulling no punches today as I tell you all the ways that hockey has disappointed me over the last year. SECURITY PEOPLE: In attending the Heritage Classic in Winnipeg, I had hoped to get a few pictures of the men I grew up idolizing in Teemu Selanne, Dale Hawerchuk, Wayne Gretzky, and Paul Coffey. Instead, I was informed by the security people at the event that my camera was not permitted into the event due to the lens being greater than three-inches. The NHL's rules state no camera with lenses over six-inches. I was a little peeved that people can't get rules written clearly in black-and-white correct. OFFICIATING: The crackdown on hooking and holding when we came out of the lockout was great! Players could skate, and obstruction meant there would be a power-play. In the decade that has followed, however, we seem to be reverting back to the "dead puck" era where hooking, holding, and obstruction are common fare once more. Start calling this crap again and scoring will go back up. THE TRAPEZOID: Is there any need for this? Let goalies roam. Let goalies play the puck. Let goalies get caught out of their net through bad judgment. Kill the trapezoid and let the good goalies who can handle the puck make it harder on the dump-and-chase teams. Don't put limits on the good goalies who have honed these skills. NWHL: There are so many things that could said here, but I want to stress that not one of the problems being experienced by the league were caused by the players. For a league that changed women's hockey by introducing paid salaries, it was that same leadership group that mismanaged the league into its current mess. For all the good it has done, the NWHL has erased all of those good intentions with the crap it has pulled in the last year. WOMEN'S HOCKEY COVERAGE: There simply isn't enough coverage by mainstream media, and the new media that covers the women's game leave a lot to desire when it comes to objectivity. While Sportsnet does cover the CWHL on occasion, there should be more coverage from the big media outlets. I see the occasional NCAA game on TV, but they are few and very far between. There is no CIS coverage whatsoever outside of a few websites. There are a pile of NWHL apologists, but almost none show objectivity. Women's hockey journalism needs to change in a major way. REGIONAL BLACKOUTS: I get that Sportsnet and TSN don't play nice together, but I'd really like to watch hockey on TV when the Jets aren't playing. I understand how the regional rights work, but the blackouts are dumb when Calgary or Edmonton are playing and the Jets aren't. Use some common sense here. INCLUDING THE LITTLE GUYS: When we started The Hockey Show on UMFM, we had all the aspirations of being a big-time player in the hockey media coverage in our community. We're slowly being accepted by that market, but our inquiries into working alongside Rogers for Hometown Hockey and Hockey Day In Canada were outright rejected. Why? Is Rogers threatened by our Thursday night show? Be a leader, Rogers, and help the little guys by allowing them to work alongside the best of the best in the industry. CIS FANS: Each week on The Rundown, I ask that you go and see your local women's hockey action at your community's local university. We've seen some good crowds at the University of Manitoba, but we can always use more. Week after week, you're missing some of the best hockey this nation has to offer by ignoring this inexpensive hockey action. Make the leap - go see the men and women play. You may see a Spengler Cup netminder in Saskatchewan's Jordon Cooke. You might see former WHL stars such as Jordan DePape or Nick Zajac. You will definitely see Olympians in Sasha Vafina and Venla Hovi. Do yourself a favor and get out to a game or two! OLYMPICS: Figure it out, NHL and NHLPA. This is where your product truly shines. Make it happen in 2018 or you're going to see a lot of fans turned off by your greed and continued labour issues. If you don't go in 2018, you might as well just let everyone know there will be another lockout in 2020 that will bring this sport to a grinding halt once more. IT'S ABOUT THE FANS: I know you have a great initiative planned for February 2017 called "Hockey Is For Everyone", but you really need to live by those words and make hockey affordable again. Too many kids are leaving hockey due to the costs, and too many kids miss out on seeing their heroes live in-person because the cost of going to games is too high. This is going to take major efforts from all sides, but this is something that has to happen before hockey prices itself out of 99% of families' budgets. Most of these grievances seem fairly easy to fix, but the underlying problem to everything seems to be money. In this season, we should be putting the financial stuff aside and looking to help one another. If money is the root of all evil, let's be a little less evil in 2017 by doing the right thing and worrying less about the bottom line. If we want hockey to thrive, all levels of hockey need to work together to make this great game even better in 2017 and moving forward. 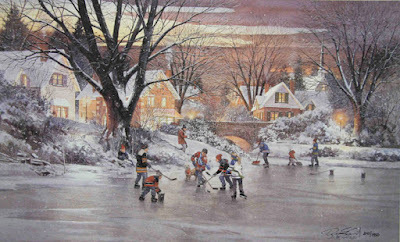 Let's pull together next year and make it the best hockey year ever! The Hockey Show, Canada's only campus-produced hockey radio show, returns tonight with a special guest as we get you set for a big day on Sunday. No, we haven't kidnapped Santa Claus and forced him to talk hockey. Instead, we welcome back a man who has made us laugh with his wheat-chewin', bumpkin ways. Tonight, The Hockey Show is proud, honoured, privileged and humbled to welcome back one-half of the duo who created those ol' country boys Wayne and Daryl of Letterkenny as Nathan Dales makes his return to the program! 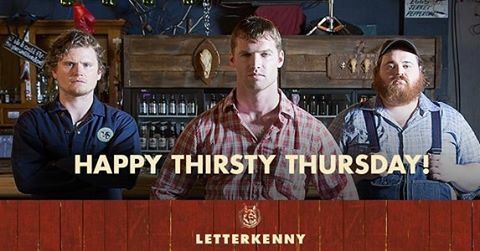 Nathan, seen on the left in the photo above, returns as Daryl on Sunday during the Season Two premiere of Letterkenny on CraveTV! We welcome Nathan back to the show to give us a little preview of what's happening in the town of Letterkenny this season. We'll also get an update on other projects Nathan is working on, and we'll get as much info out of him about Goon: Last of the Enforcers where he plays a character named Petr Petrov! Nathan is in Calgary tonight, so we'll talk about the Flames, the success they're having, Chad Johnson vs. Brian Elliott, and anything else we can fit into the show! It's going to be a heckuva holiday show with Nathan Dales tonight as we talk Letterkenny and Flames on The Hockey Show! If you're a proud owner of an iDevice or Android device and want to listen to Nathan Dales on The Hockey Show, you can easily listen to the show by downloading the UMFM app! 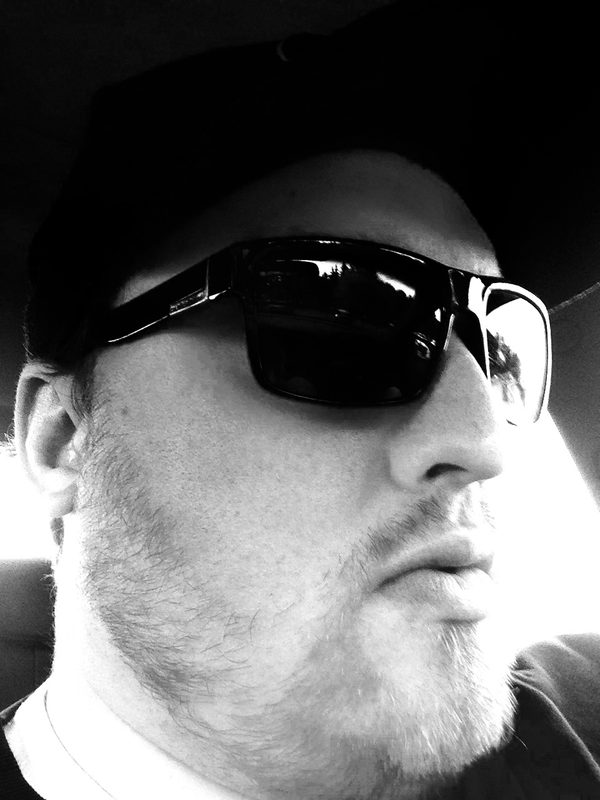 Just follow this link on your iDevice or this link for your Android device and get the UMFM app! It's never been easier to tune into The Hockey Show! Give the gift of great, free music and interesting interviews by downloading the UMFM app today! We welcome Nathan Dales back to the show tonight where we talk Wayne, Daryl, Letterkenny, Goon, the Calgary Flames and more on The Hockey Show only on 101.5 UMFM and on the UMFM app! The man to the left is former Washington Capitals sniper Peter Bondra. Bondra played for a couple other teams in his career, but he spent the vast majority of time in Washington, DC. The Slovak has done many great things over his career, but he's doing more for the international game now in his birthplace of Slovakia and in developing countries around the world. And while he suited up for Ottawa, Atlanta, and Chicago late in his career, he's still a proud member of the Capitals alumni and resides in Maryland with his wife when he's not on the ice! One of the things Bondra does today is coach at clinics in some of the developing hockey nations. One such adventure took him to the United Arab Emirates where he spent some time coaching at a youth clinic in Abu Dhabi. One of the people he met there was a lady by the name of Fatima Al Ali who plays for the UAE national women's program, coaches in Abu Dhabi, and referees games around the city. Bondra was blown away by this young lady's dedication to the game, but he had no idea just how good Fatima was until she got a stick in her hands on the ice. Watch the video below! Yeah, she's pretty darn incredible with a stick and puck considering where Abu Dhabi is located. Fatima could probably run clinics in Canada and no one would blink an eye based on her skills. She makes me look like I've never played the game before! She's amazing! In the course of getting to know Fatima, Bondra discovered that her favorite player was Capitals sniper Alex Ovechkin and her favorite team was the Washington Capitals. Bondra brought Fatima's story back to the Washington Capitals, resulting in the following video being recorded last week. How cool is that? Fatima and a friend will be flown from Abu Dhabi to Washington DC where she's invited to attend a Washington Capitals game in February and meet the team including her idol Alexander Ovechkin. I said it yesterday with the Coyotes that more pro sports teams should reach out to their fans and communities with efforts like these, and I'm thrilled to see the Washington Capitals reaching around the world to give Fatima a chance to realize her dreams. That's exactly the kind of stuff pro sports teams should be doing with their wealth, and, as a Penguins fan, I have a whole new-found respect for the Capitals organization. Hockey is for everyone. Fatima Al Ali is doing her part to make hockey a reality in Abu Dhabi, UAE, and the Washington Capitals are making her dream a reality by reaching out to her. Peter Bondra and the Washington Capitals are doing their best to make hockey an international game. I won't make any excuses for not covering the Arizona Coyotes except when times are tough. News is news, and I like to give my take on it. If you're keeping up with the theme this week on HBIC, you'll notice a lot of heart-warming stories about family and doing great things for others. 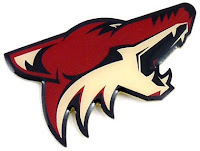 Today's entry is one of those stories and it involves an amazing thing the Arizona Coyotes did for a team of amazing people about a week ago. Honestly, this is the sort of thing all professional sports franchises should be doing and certainly more often than once per year. Before we get to what the Coyotes did, we need to meet this team of individuals who seem to love hockey more than anything else on the planet. The One Step Bobcats are a team of individuals with special needs who are breaking through walls and barriers at which most would expect them to stop only to show that they're one heckuva hockey team. They became Arizona's first special needs team to become part of the American Special Hockey Association. I can sit here and tell you about the Bobcats all day long, but I think the following video says a whole lot more about the love, determination, and opportunity that went into making hockey dreams come true. If that video doesn't put a bit of a lump in your throat, we might need to check your pulse. Seeing these young men excel on the ice is a tribute and a testament to the human spirit, and these are the stories that go untold when the business of sports creeps into the picture. Now you may have noticed Howler, the Coyotes mascot, in that video and on the ice with the Bobcats. The Arizona Coyotes have been supporters of the One Step Bobcats for a while in helping them get ice-time and providing them services, but the Coyotes took their involvement one step further last week when they invited the Bobcats to Gila River Arena for an arena tour to see where their heroes play. What the Coyotes did for these young men is extraordinary. For a team that is often mocked for its place in the standings and the news made off the ice, the Coyotes have my full respect for helping a team that never asked for help, but certainly needed it. The smiles and memories created today by the Coyotes for the Bobcats - seen throughout the video - will last a lifetime, and Matt Shott's efforts in getting the Bobcats onto Gila River Arena with their new gear and personalized jerseys makes him a hero. Hockey is for everyone. The Arizona Coyotes are making sure of that. I'm not one to cheer for the Edmonton Oilers, but I have to admit that they're battling in games and winning when most would have written them off. 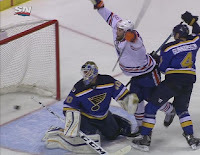 Tonight's overtime victory over the St. Louis Blues are one of those games where the Oilers might not have been given any chance in the past, but they found a way to win tonight even without playing their best hockey. That's the sign of a maturing team, and while that's been said for the past decade it seems to be happening this season with the kids and veterans blending together. However, today's article isn't going to be some Mark Spector Oilers story, though. This is about Patrick Maroon and his reaction. Maroon scored a goal tonight for the Oilers with his wife and son in the crowd. You may not know this, but Maroon lives in Missouri in the off-season, so he doesn't get to see his son a lot during the season when he's with the Oilers. Sportsnet's Gene Principe decided to show Maroon his son's reaction to his dad's goal, and I gotta say that Maroon's emotional response in seeing his son cheering for his dad tugs at the ol' heart strings. If that didn't melt the ice around your heart, I'm not sure what will. That's a dad who loves and misses his son during the season seeing his boy's joy for his dad's accomplishment. Folks, this is one of those moments that makes hockey, and sports in general, so great. I'm glad Gene Principe showed Patrick his son's reaction, and kudos to ending the interview to let Maroon have his moment. That's professionalism, kids. The fact that the Oilers won is a footnote on a great story like this. With Christmas approaching, Patrick will get to spend some time with his son, but as most fathers will tell you it's never enough time. When Patrick looks back on his career after retiring, I'm sure this will be one of those moments that will never fade into the many highlights he's experienced. In continuing with the weekly tradition of posting The Rundown, this week's article jumps off the coasts of North America for a look around the international game. While Canada and the US battled this week in Plymouth, Michigan in their annual December series, there's a ton of great hockey and fantastic stories coming out of hockey markets where one may not think women's hockey has a foothold. While this series focuses on Canada West women's hockey during the season, the break gives me a chance to really focus on some great people and players elsewhere on this blue marble in space. The best part is that CIS-trained women are making an impact on the international scene as much as they are here at home! Here are some of those stories! For a country who has never played in an women's hockey event at the Winter Olympics, France is making short work of its opponents in this opportunity. After handing China a 3-0 loss and downing Italy 3-1 in their opening games at Aren'Ice in Cergy-Pontoise, the Frenchwomen hammered Latvia 8-1 this past weekend to advance to the final stage of qualifications to take place at Hakucho Oji Ice Arena in Tomakomai in Japan from February 9-12. The win, witnessed by 928 fans in the arena, was paced by a pair of goals and an assist from the University of Montreal's Emmanuelle Passard. The 24 year-old credited her move to the RSEQ of the CIS as a reason for her game improving. Passard is now one tournament away from appearing as a member of Team France in the PyeongChang 2018 Olympics. "We are very happy and joyful. We came here to win first place and now we're there. Our physical play really made a difference," Passard told Martin Merk of IIHF.com. "We know that in the next round the opponents will be tougher but everything is open and I think we will be able to challenge these teams. The games will be faster, the players will be more skilled and the goalies will be better. We need a strong team play and to play solid defensively because there we will pay immediately for every mistake." Goals for France came from Soline Fohrer, Passard, Chloe Aurard, Passard again, Lara Escudero, Betty Jouanny, Fohrer again, and Marion Allemoz of Les Canadiennes of the CWHL. It was the fifth-straight victory for the Frenchwomen over Latvia since a 3-2 loss at the 2004 IIHF Ice Hockey Women's World Championship Division I tournament. In Japan, the Frenchwomen will play in a pool against Japan, Germany and Austria with a berth in the 2018 Olympics on the line! Vive la France! Another team moved onto the final qualification stage as Norway used a 4-0 win over Hungary, a 5-0 win over Kazakhstan, and a 6-2 drubbing of Slovakia to claim a spot in the final qualification tournament being held at the Sport-und Kongresszentrum in Arosa, Switzerland on February 9-12. Like France, Norway's women's hockey team has never played in the Olympics, and they seem focused as they gear up for a trip to Switzerland. "Our girls stayed confident all the time, we had a few penalty kills too many, but everyone worked together and stayed positive and that's what I expect from them," Norway head coach Laura Rollins told Henrik Manninen of IIHF.com. UBC's Mathea Fischer played a big role for the Norwegians as the 19 year-old had two goals and an assist against the Slovaks to book her team's trip to Switzerland. Helene Martinsen, 16 year-old Millie Sirum, Lene Tendenes, and Silje Holos were the other goal scorers for Norway. Fischer's efforts in the three-game tournament saw her lead the event in scoring with three goals and three assists, lead in goals and tie for the lead in assists, and saw her go 34/52 at the face-off dot for a 65.38% winning percentage. The UBC Thunderbirds star had herself a heckuva tournament! Two years ago, Latvia set an IIHF record when two sets of mothers and daughters suited up for a World Championship when mother Inese Geca-Miljone and daughter Līga Miljone (easily recognizable with her white gloves and skates!) joined another mother Aija Apsite and her daughter Agnese Apsite as the first mother-daughter combos to play on the same team! Inese moved into an assistant coaching role with the team at this past tournament, but the Apsites added another player to the Latvian ranks when goaltender Kristiana suited up in this tournament, making the the Apsites the first mother-and-two-daughters to play in an IIHF competition game! Aija, a defenceman, is 42 years young. Eldest daughter Agnese is 18 years-old and younger daughter Kristiana is 16 years-old. While Aija might be nearing the end of her career, her two daughters will press on and carry the proud Apsite name forward as they look to write new history for the Latvian national team! And maybe, just maybe, we'll see the Apsite sisters in the Olympics in the future! Canada and the US are battling in their annual December series once more, and the first game of the two-game set went last night in Plymouth, Michigan. Canada, on the strength of a Rebecca Johnston hat trick, took Game One by a 5-3 score. It was a rather uncharacteristic game for the Americans as passing seemed off and they were unable to generate a lot of quality chances on Shannon Szabados who took over in net after Ann-Renee Desbiens was injured in the early minutes of the game. However, the Americans were not ones to waste opportunities as they built a 3-1 lead five minutes into the second period. The comeback was led by Jill Saulnier and Johnston before Natalie Spooner put the red-and-white out in front with 18 minutes to play. Johnston's empty-netter would seal the deal. I was especially impressed with the play of Halli Krzyzaniak on Saturday night. The Manitoba-born defenceman was a steady pillar on the blue line, and she was directly involved on Johnston's first goal as she sent a pass up the boards from behind her own net to Johnston who converted the feed. The 21 year-old looks like she's going to be a mainstay on the Canadian blue line for years to come, and her maturity and steadying influence as a veteran player at her age have to make Canadian fans proud! As you may be aware, next Sunday is Christmas Day. The Rundown will take a break in celebration of the holiday. If you're still looking for a few last-minute gift ideas, I implore you to buy tickets to a CIS women's hockey game. The action is incredible, the women are outstanding athletes, and the cost is minimal. Players such as Charline Labonté, Hayley Wickenheiser, Iya Gavrilova, and Mélodie Daoust all spent time at CIS schools before jumping to the CWHL and to their respective national teams. This is where you'll see great international stars such as Mathea Fischer, Sasha Vafina, and Venla Hovi for a fraction of the cost you'd be charged to see them with their national teams at the Olympics. Do yourself a favor: buy a CIS women's hockey ticket. You won't regret it! Maybe He Needs More Spinach? In a rather strange occurrence, it was announced that Boston sniper David Pastrnak would miss the next few games as he was going to miss the next few games after undergoing surgery on Friday Newton Wellesley Hospital just outside Boston. Rarely do superstitious hockey players change their routine when things are rolling along in their favor, and one could say that Pastrnak has been flying high all season as the Czech forward would have entered play on the weekend as the second-leading goal-scorer in the NHL. Instead, Pastrnak will be sidelined for a few games after having his "Popeye's elbow" on his right arm fixed by Dr. Matthew Liebman. For those that are wondering, the exact term for Pastrnak's injury is the removal of an olecranon bursa. The olecranon is the pointy tip on the elbow joint and the bursa is the thin sac of fluid that sits between this tip and the skin which allows the skin to move over the bone without being caught or torn. The sac contains very little fluid normally, and is often found laying flat between the bone and skin. When inflamed or irritated, however, the sac fills with fluid as the body works to repair itself. 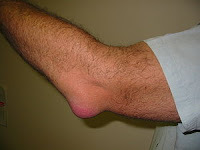 The swelling that occurs to cause the bursa is most often a result from trauma to the elbow, but pain usually is found with an infected bursa and surgery is usually needed to remove the bursa before the infection spreads. 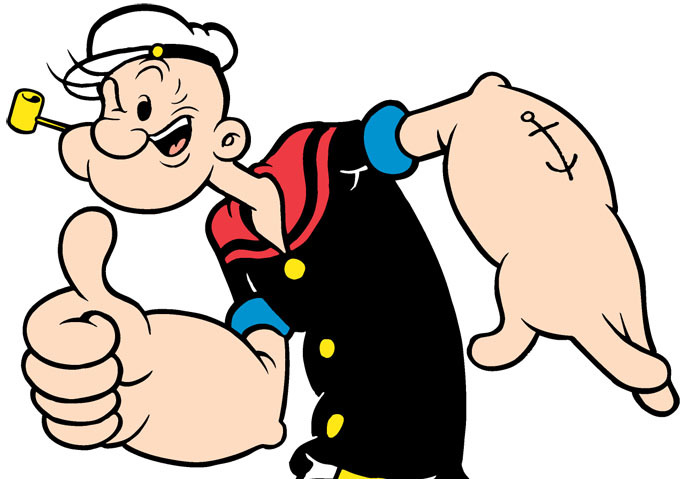 The swelling, however, is how it got its more famous name of "Popeye's elbow" as seen above on the cartoon character's image. I can assure you that I'm not Dr. Matthew Liebman, so I can't accurately tell you whether or not the bursa on Pastrnak's elbow was caused by an infection. The injury is fairly common, though, and Boston centerman David Backes actually had the same treatment done for his elbow in October. My guess is that the physical nature of hockey caused the bursas to form for both Pastrnak and Backes as repeated mini-traumas or one big trauma - a fall to the ice or crash into the boards - caused the injuries to occur. Like a concussion, though, bursas can and do occur more easily for those that have previously suffered the injury, so this might not be the last time these two Bruins visit Dr. Liebman. "David underwent a successful removal of the olecranon bursa from his right elbow on Friday, December 16 at Newton Wellesley Hospital by Dr. Matthew Liebman," Bruins general manager Don Sweeney said in a statement this morning. "He will likely be unavailable for the games on Sunday and Tuesday. His condition will be re-assessed on a day-to-day basis." The Bruins host the Kings on Sunday and the Islanders on Tuesday before heading out on the road before visiting the Panthers and Hurricanes on Thursday and Friday, respectively, prior to the Christmas break. I assume that the Bruins will keep Pastrnak off the ice for the next week, but he is chasing Sidney Crosby in the goal-scoring trace so perhaps we'll see him back. Regardless of him chasing Crosby, Pastrnak has been an offensive force for the Bruins this season so getting him back in the lineup sooner than later is good for the team. "It is not easy when you hear that kind of news when one of your better players isn't here," Bruins coach Claude Julien told Rich Thompson of the Boston Herald. "That is one of the challenges you have to face and get through. "We will certainly do our best and get some wins here without him and hopefully it is shorter than longer and that is all we can do." Thankfully, it's not a long-term injury. As stated above, it can flare up again, but I'm sure the Boston training staff will keep a close eye on Pastrnak's elbow for the next little while. While I'm not sure what nickname the Bruins have for him, Pastrnak's new name could be "Popeye" with that elbow. If nothing else, I'd expect his locker to be filled with cans of spinach when he gets back from his injury! While the title of this article may conjure up images of Irish rock band Thin Lizzy, the real stars of this article are the hockey players from the town of Letterkenny known as Jonesy and Reilly. Letterkenny, the TV show, returns on Christmas Day with the whole gang, and the two hockey-playing characters will be front-and-center on the ice once more in Season Two. Jonesy, played by the dark-haired Andrew Herr, and Reilly, played by the blond-haired Dylan Playfair, were incredible comedic actors in their debuts in Season One, and I can only imagine the hi-jinks they get into in Season Two on CraveTV next Sunday! Jonesy and Reilly are back with this short segment today that should be seen by all hockey players. Because of their scoring prowess on the ice, the advice dispensed by Jonesy and Reilly in this clip should be heeded by every hockey player of all skill levels. Flow... and snow! That was awesome embarrassing. Honestly, I'm psyched for Season Two of Letterkenny found exclusively on CraveTV. Tune in to see all the craziness that Wayne, Daryl, Katy, Jonesy, Reilly, and the rest of the cast find themselves in as the new season kicks off on December 25! I'll be tuning in for some Christmas Day laughter as Season Two gets underway. Hopefully, you will too! The Hockey Show, Canada's only campus-produced hockey radio show, is back tonight for a first in the show's history! If you've listened long enough, you know that we never get any Jets or Moose on the show despite the show talking about the two teams a lot. True North Sports and Entertainment has pretty close ties with that other sports radio station in town, so we get that we're down the pecking order when it comes to getting these players to appear on our show. Tonight, though, we will have a gentleman speak to us live from MTS Centre prior to the Jets-Panthers game! We're excited about it as we'll get all the news and info from the Jets' locker room on our show! The man we'll be talking to is Mr. Scott Billeck, seen to the left, who is the Winnipeg Jets reporter and correspondent for NHL.com! Scott has the inside scoop on a lot of info, so we thought it would be good to go to the source on things such as what's with all the line juggling, what exactly is going on with Tyler Myers' injury, why do the Jets goalies seem incapable of winning games for them, and what do the Jets do when it comes to the expansion draft! Scott also is a huge UFC guy, so we'll squeeze a question or two in about UFC as well before he gets back to his NHL.com job at 6pm. We're excited to welcome Scott to the show, and I'm guessing we'll be talking with him throughout 2017 and beyond about the Jets, the NHL, and the UFC! On the second-half of the show, Beans, TJ, and I will talk about the amazing job done by Bisons swimmer Kelsey Wog at the FINA World Championships last weekend, Penny Oleksiak winning the Lou Marsh Award and why Sidney Crosby shouldn't have won it, the Bisons women's hockey team at ScotiaBank Girls Hockeyfest and the great time experienced by all at that event, a new addition for a guest of the show, the horrendous Stadium Series uniforms being worn by Pittsburgh and Philadelphia, some Wheat Kings being added to the CHL Top Prospects Game in 2017, and the passing of Alan Thicke. It's a busy show, so make sure you tune in tonight at 5:30pm! 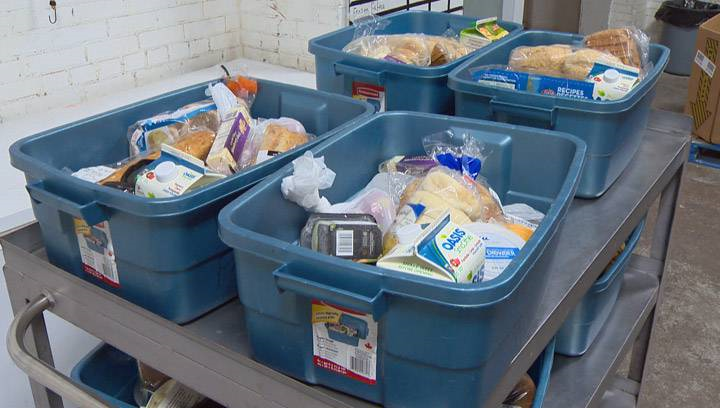 The Bisons women's hockey team is putting together a pile of hampers for the less fortunate this holiday season, and they want your help as the approach the final weekend for donations! The team is looking for non-perishable food donations or monetary donations that will go to making up baskets of food for Manitoba families! You can contact Bisons forward Karissa Kirkup to arrange for a pickup, and she can be reached at 204-851-4886 or by email at kirkupk3@myumanitoba.ca. This is an excellent cause, we encourage any and all people, businesses, and organizations to match UMFM's donation of $100 cash and/or our donations of $100 in non-perishable food to the Holiday Hamper drive! Thanks to all who donate, and to the Bisons women's hockey team for helping those that need a little help this holiday season! Also, if you're a proud owner of an iDevice or Android device and want to listen to The Hockey Show, you can easily listen to the show by downloading the UMFM app! Just follow this link on your iDevice or this link for your Android device and get the UMFM app! It's never been easier to tune into The Hockey Show! Give the gift of great, free music by downloading the UMFM app today! We welcome Scott Billeck who knows more about the Jets than the three of us collectively for a chat about the local NHL team before we turn our attention to swimmers, young skaters, babies, jerseys, prospects, and a TV legend on The Hockey Show only on 101.5 UMFM and on the UMFM app! 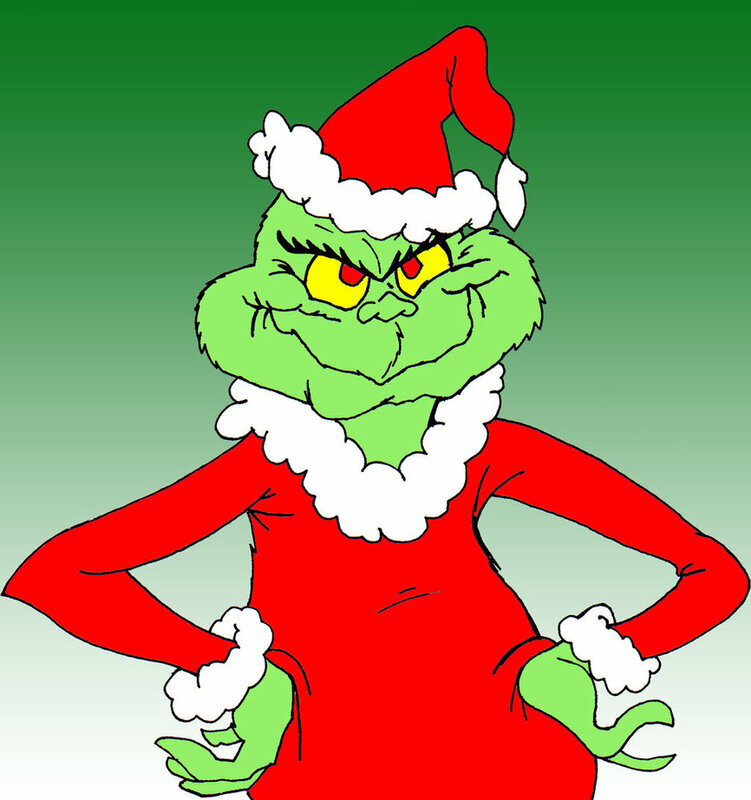 When Thurl Ravenscroft first sang about how horrible the Grinch was way back in 1966, I'm not sure if he knew how the song would pass the test of time with flying colours. When the song is heard today, people instantly know where the song is from and what it represents. Some people may even know a Grinch-like person or two, so I thought might be a good time - the first day of Christmas - to bring out the anti gift-giving guide of all the things you probably shouldn't spend your money on for a hockey fan this season. This list doesn't have a lot of entires, but these are probably things you should avoid if you want your hockey fan to have a festive holiday season. While some of these items may seem like a good idea on the surface, there are very good reasons why you shouldn't gift-wrap any of them. The problems with these gifts run deep and often will cause untold pain and suffering as time marches on, so leave these gifts alone and go for something practical. Like a toaster. Or maybe a pair of slippers. Just not these items below. I'd love to watch hockey in a European rink full of passionate fans who care deeply about their team. European fans sing, dance, and cheer all game long, and it looks like a great time. Teams that have immense followings seem to get cheers and jeers regardless of where they go, so it makes for a fun rivalry for fans. Jokerit in the KHL: Operating losses total €28.8M in 2 yrs, own capital negative. Last season losses: €15M, revenues €10.2M. Jokerit is losing hand-over-fist in money, and the owners - Harry Harkimo, Boris Rotenberg, and Gennadi Timchenko - just keep pumping more money into the club. Jokerit is a proud franchise with a deep and rich history in the SM-Liiga in Finland, but it seems that the allure of the Russian league for the Finnish-Russian citizens who own the team is everything they want. When you lose nearly €30-million in two years, it might be time to explore options. On top of Jokerit's red ink, a December 1, 2016 report from Sport.sk, HC Slovan Bratislava has not been paying its players as it struggles through another KHL season. These are glaring issues that speak to the weakening Russian ruble under which all teams conduct business. In Jokerit's case, their revenues don't even cover the team salary of €13-million, so they were already behind the eight-ball before the puck dropped this season. If you're a hockey fan in Europe, maybe hold off on buying those 2017-18 KHL season tickets. Your local KHL team may not be part of the KHL next season. You want your hockey star to be protected by the latest and greatest equipment on the market, and you go hunting for a new helmet for your soon-to-be-NHL star. When you arrive at the store, you see racks and shelves filled with all sorts of helmets and helmet brands, and your head starts to spin. You realize that you're on a budget, though, so you start to look for the best helmet at the most economical price. CCM is a trusted name in hockey, so you opt for the $50 CCM V04 helmet. According to the Virginia Tech Helmet Ratings report, your hockey star is basically wearing a concussion magnet. The aim of the report "is to have helmet manufacturers lower head acceleration and reduce the risk and number of concussions a player suffers over a season". As you can see on that report, the higher the STAR value is, the worse the helmet is for reducing the risk and number of concussions by those wearing that type of helmet. Only two helmets were deemed to be "Good" by Virginia Tech: the Bauer RE-AKT 75 at $119.99 and the Warrior Krown 360 at $79.98. I appreciate that people have budgets when it comes to Christmas, but safety for your hockey star should override everything else. Invest in a good helmet and leave the CCM V04 sitting on the sidelines. I have never used a composite stick in my life, but my days of dreaming about the NHL are long done. I have picked them up, and they're amazingly light. They seem to be able to withstand some incredible stress when it comes to shots. All of this is great if you're older than 10 years-old, but kids who are starting out in hockey and getting into the game don't need $100 sticks. Ever. Look, I get that there's a "cool factor" when they see their hockey heroes using these $300 sticks on TV in the NHL, but those guys have earned the right to use those sticks. They're also making enough money to replace their own $300 stick if it happens to break. Be smart, grab a wood stick, and let your kids know that they haven't quite reached the ability to deliver a one-timer like Ovechkin or a slap shot like Weber just yet. Once they hit the more competitive hockey ranks, you're welcome to spend your money any way you like. But kids at 10 aren't needing a $90 stick just because Crosby uses one. Let's be honest: this would be the coolest gift ever. You have your own NHL franchise, you're part of one of the world's most exclusive clubs, and you bring pride to a city of region that needed a boost of enthusiasm. This will just be like all those NHL video games you played where you craft an expansion team from a group of unwanted players and free agents only to win the Stanley Cup a season later. The reality is that the Las Vegas franchise has all sorts of problems that have embarrassed the franchise and league since the fateful Las Vegas night where they announced the name of the team. People don't like the team name. The logo and name have a trademark issue. The initial video to introduce the team didn't play. Twice. Gary Bettman was booed in Las Veg... wait, that's normal. The cost of this expansion franchise is ballooning daily, and I cannot understand why any billionaire would spend half-a-billion dollars on an NHL franchise when it cost just $80 million to join the league just 16 years ago. That's more than six-times the cost of the Wild and Blue Jackets, and those teams have already been sold at least once. The sticks shock on this franchise should have scared even the most brilliant financial and business people away, but Bill Foley and the Maloofs wanted a piece of the action. Good for them. Let's see how long they hold out in the Las Vegas desert for until someone wants out as the costs continue to escalate before they even have a player on a roster. I'm sure there are more examples, but those are a few suggestions of things to avoid this holiday season. If you have more, feel free to post them in the comments section and we can chuckle about gifts that shouldn't be given. This photo of Alan Thicke, taken August 11, 2016 by Janis Ramsay, might be the last photo anyone got of the Canadian icon in hockey gear. If you haven't already heard, Alan Thicke passed away today after succumbing to a heart attack suffered while playing hockey in California. The long-time hockey fan was best known for his role as Dr. Jason Seaver on the ABC sitcom Growing Pains from 1985-92, but Alan Thicke has successfully navigated all forms of media - author, songwriter, movie star, talk show host, game show host, producer, narrator, radio, and TV icon. He was 69 years of age. Thicke was born in Kirkland Lake, Ontario on March 1, 1947. After his mother divorced and remarried, they moved to Elliot Lake. Thicke went on to attend the University of Western Ontario at the age of 16 after he skipped grades four and six, and he graduated with a Bachelor of Arts degree in 1967. From there, he was hired by the CBC and worked under Lorne Michaels of Saturday Night Live fame. His big break came in 1980 when The Alan Thicke Show debuted on CTV, replacing The Alan Hamel Show. The show would last from three seasons on CTV until Thicke decided to leave and head for Hollywood. The bright lights of Hollywood were good to the Canadian actor as he found parts on a number of TV movies and played several roles on TV's The Love Boat. In 1985, ABC casted Thicke for the role of Dr. Jason Seaver on Growing Pains which has been syndicated in 65 different countries. Earlier this month, when asked of how he developed the character of Dr. Jason Seaver on CBC's q with host Tom Power, Thicke replied, "I think I brought some of my own values, my good old Canadian, northern Ontario backwoods values to the character and, in turn, I learned something from what they were writing, so it was a nice exchange." It was during this time that he formed a bond with a young man playing hockey in Edmonton that would last until he passing today. Thicke was a close friend of Wayne Gretzky who had fallen for a young actress by the name of Janet Jones who first met Gretzky when he was a judge on Dance Fever in 1984. With his playing days occupying most of his time in Edmonton, Gretzky would frequently stay at Thicke's residence while visiting Los Angeles to see Jones. It turns out that Alan Thicke's house would play a major role in one of hockey's most unbelievable days. I was reminded of it a few days ago on the occasion of the anniversary of his trade from Edmonton to Los Angeles (on Aug. 9, 1988). He was house-sitting at my house in L.A. the night he got traded. I was in Norway with my other son (Brennan), and Wayne and Janet were house-sitting for my son Robin (11 years old at the time). I called from Norway because I picked up the Oslo morning paper and saw pictures of Gretzky -- but I couldn’t understand the text, of course. And I thought maybe there had been a fire, a mudslide, a drive-by shooting, who knows? So I called home, and I learned Wayne left early in the morning; he got traded last night. He got the call at about 9 p.m., and he was gone by 6 the next morning. So we had to find a substitute nanny instantly, which is not as bad as what Edmonton had to find to replace him. Needless to say, most hockey fans will never see something of that magnitude happen in their homes! 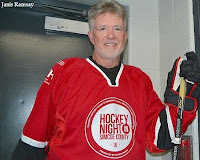 Alan Thicke has been a leader in the charitable world as well, and his continued work for charity hockey games can't go unmentioned. The picture at the top of this article was taken at the Hockey Night in Simcoe County event which raises funds for Royal Victoria Regional Health Centre, Orillia Soldiers' Memorial Hospital, Georgian Bay General Hospital, and Barrie Colts Community Fund. He was a regular at Wayne Gretzky's fantasy camp every year. He played in the Festival Cup charity hockey game in Toronto in 2008 in support of Right To Play. He was a major supporter for juvenile diabetes research initiatives, and he often lent his name and efforts to Make-A-Wish Foundation, Red Cross, Multiple Sclerosis Society, and many others. While most don't associate Alan Thicke with all his charitable efforts, the man truly believed in helping others. When it came to his hockey loves, he was a long-time follower of the Montreal Canadiens in the 1950s and 1960s before switching allegiances to the Los Angeles Kings once he moved to California. He had a short stint as Maple Leafs fan, but (thankfully) that didn't last long. In a celebrity game, Gordie Howe broke his nose. In a separate game, actor Michael Vartan hit Thicke in the face with an errant puck, costing the actor five teeth and requiring 30 stitches to fix the damage. Through all of this, the man was a die-hard fan, attending as many Kings games as possible and bringing along new waves of celebrities to the games to introduce them to the sport. Alan Thicke never lost his Canadian roots in America. Some amazing tributes came out of Hollywood yesterday, showing just how many lives Alan Thicke touched as an actor and friend. Alan Thicke was proudly Canadian, never forgetting his roots as he soared to stardom. My deepest condolences to his family and friends. The fact that Alan Thicke suffered his heart attack while playing hockey is no laughing matter. Automated external defibrillators should be in every arena, and every arena staff member should know how to use one in order to save lives. While there were no reports of an AED device being used, I hope the arena where he was playing has one and the staff know how to use it. 2016 has been an awful year for the loss of celebrity icons. Losing Alan Thicke this young just seems cruel. Rest in peace, Alan, and know that you were a beloved actor, friend, mentor, and Canadian. To Tanya Callau and his sons Brennan, Robin and Carter, I wish you all the best in this time of grieving. No one deserves this kind of news during what is supposed to be the most wonderful time of year. Until next time, raise your sticks high in honour of Alan Thicke! 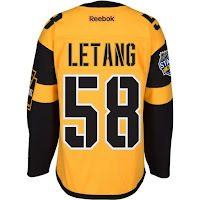 In working to get over the disappointment of the Philadelphia Flyers' Stadium Series uniforms, I thought it might be a good idea to post their opponent's jerseys to see if that helped. I'll admit that I was hoping Pittsburgh would keep things simple and classy, but they went a little overboard with some of the accoutrements. However, the comparison between the Flyers and Penguins when it comes to their jerseys is really no comparison at all. The image to the right is what the Penguins will be wearing, and it appears that they are throwing back to the yellow jerseys of yesteryear. 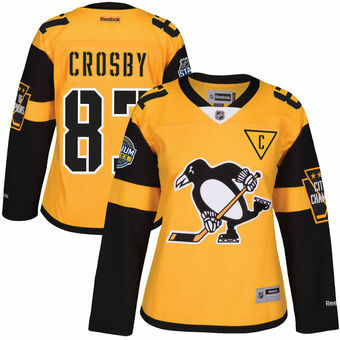 The skating penguin logo is featured prominently on the yellow jersey, and the single yellow stripe on the black sleeves give a nice splash of colour to a black element. Unfortunately, the compliments will end there as there really isn't anything else to celebrate with these uniforms. In saying that, I'm actually disappointed when comparing the Stadium Series game to the Winter Classic game. We'll start with this monstrous patch on the sleeve. In the 1970s, Pittsburgh was known as the "City of Champions" thanks to the multiple championships won by the Panthers, Pirates, and Steelers in this era. The Penguins, founded in 1967, were not part of that championship era, but it's a nice civic touch by the Penguins to incorporate the other pro teams in the city, especially when playing at Heinz Field where the Steelers play. The four stars at the top of the patch are representative of the four Stanley Cups earned by the Penguins since 1991 to reinforce the "City of Champions" theme. However, this patch is ENORMOUS on the sleeve! Why does it have to be so big? I'm sure this is the biggest patch ever worn in the NHL. From there, we shift our focus upwards to the captaincy mark that is outlined in a golden triangle. The downtown Pittsburgh area is officially known as the Golden Triangle, and this area is bordered by the Allegheny River and the Monongahela River to form the triangle as they merge into the Ohio River. 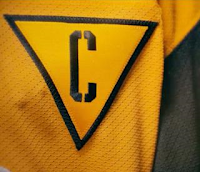 Again, Pittsburgh does a good job in bringing civic pride into the jersey, but the triangle looks out of place in outlining the captain's "C". 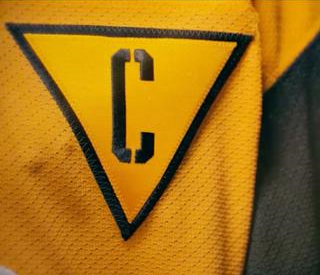 While there are no images of it, the alternate captain's "A" will make that downward-pointing triangle look even worse. What exactly were the designers thinking when it came to this font? Whoever thought of this font as a good idea and whoever approved this font to be on this jersey should lose their jobs. Immediately. With extreme prejudice. It's shocking how minor-league the Penguins look with this ridiculous font. I can't even begin to justify this design element as being civic-minded when it's not. Someone is trying way too hard to make these jerseys appealing to someone, but there has never been a time in the team's history where a font looked like this mess. This is just terrible. Overall, I like the idea of the alternate yellow jerseys like the Penguins used to wear from 1981-84. I just don't like all the additions to the uniforms that weren't needed in any way. 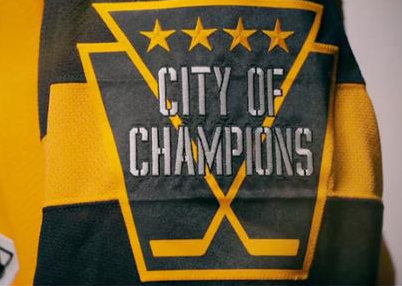 If they were going to add the "City of Champions" patch, I'm all for it in terms of honouring Pittsburgh's sports heritage, but it doesn't need to be the size of Pittsburgh. 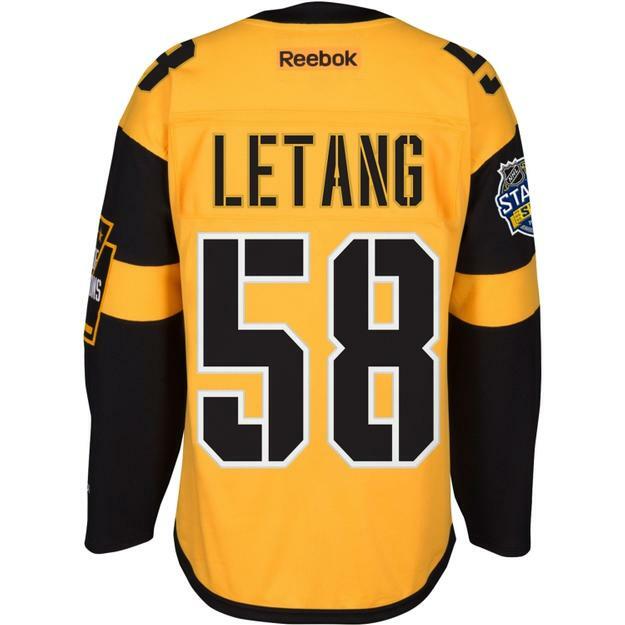 If they were going to use the downward-pointing triangle to honour the downtown area of Pittsburgh, I'm all for it but put it back where it belongs behind the skating penguin logo. And just don't use that font for anything. These "additions" are entirely subtractions. 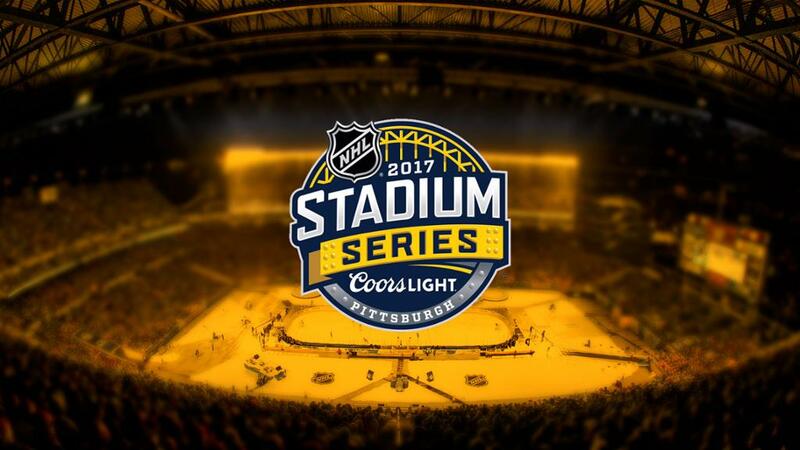 I'm sorry to say this, but the Stadium Series game in Pittsburgh is certainly one to forget in terms of aesthetics.